Trying your hand at a new email marketing software might seem like a great idea until you check its pricing & provided features. And God forbid if you have used Sendy, then you have probably spent on an under-maintenance email marketing service. Hard to install and configure. To use Sendy, you need to upload its files on your server manually. The service is self-hosted & requires a lot of technical skills where you may also need to hire help and spend extra bucks. Community forums providing a feeble support. No email template designer & visual editor for email forms and templates. Fortunately, there are few alternatives which will help you to recover from disappointment after using Sendy that we have included in this blog. To start with, all of these services are cloud-based in the first place and does not cost you set up fees/license fee. And you will be absolutely free from the burden of installation, configurations, updates etc. Further, besides resolving all the above-mentioned issues, these following tools will suffice all your business needs. You will be getting options like dedicated IP, consent-based email sending, SMTP routing and a lot more. Let us quickly take a tour now and discover why these Sendy alternatives are highly recommended for your betterment. 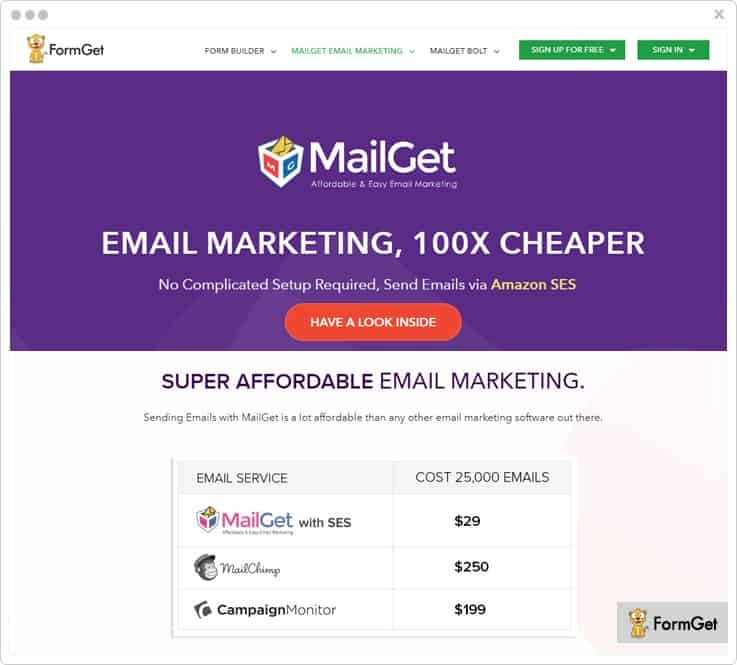 MailGet Bolt has inevitably become the preferred choice of professionals for their email marketing campaigns. 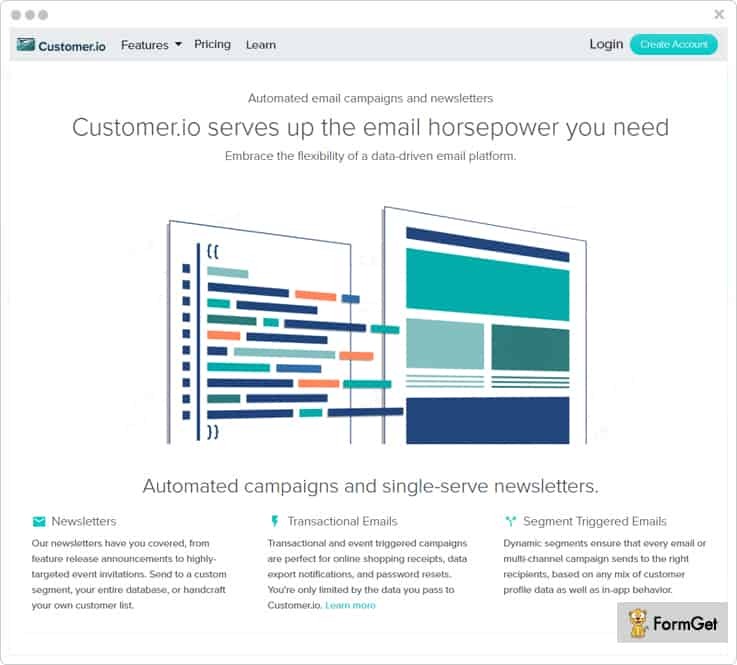 Not just for its robust drag & drop email builder to create emails but for multiple other reasons that are meant to enhance the power of your campaign. For instance, an option of adding unlimited custom tags to send personalized emails, drip automation, email scheduling, autoresponders and a lot more. Integrated SMTP – This integration suppresses the errors due to manual integration & configuration of SMTP as MailGet Bolt already possess SMTP server for email transmission. List Cleaning – By removing duplicate, invalid, inactive addresses from your list you will send emails to relevant subscribers only. And with less spamming of your emails, this process resolves one of the threats of being blocked by ISP security services. Auto Follow Up Emails – You can automate the process of sending follow up emails which will continue until you achieve your desired open rate. Craft different emails for different contacts and schedule them at the most appropriate time. Note:- It has got 22 other pricing schemes in the Advance Plan that includes costing according to the number of subscribers. 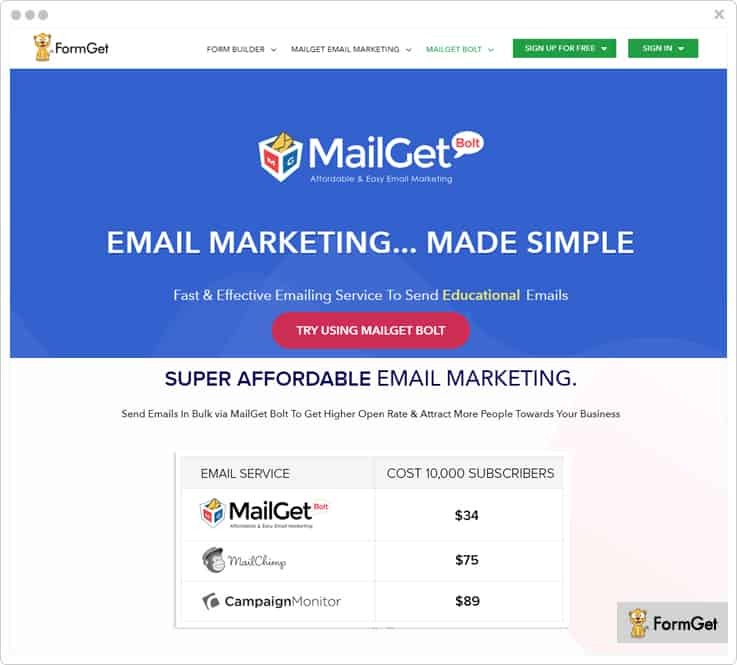 MailGet is an all-in-one solution for your email marketing campaign at a price as low as $5/month only. It has got numerous features to upgrade the standard of your campaign effortlessly. Although the list of features is quite long, predominantly you will find certain attributes very useful such as Google Analytics integration, 99% inbox delivery, email inbox preview and much more. MailGet API – Contacts automatically synchronize in your subscriber’s list via MailGet API whenever a user subscribes through your provided opt-in form on the website. This cuts down your task of importing subscriber list explicitly. SMTP Routing – It helps in processing the mass mailing as you can integrate multiple SMTP relays & select the percentage of emails to be sent from each SMTP. This route management helps in load balancing of slow network and maximize the quick inbox delivery. Subscription Form – Place high-converting subscription forms at noticeable places of your website. Embedding these sign-up forms results in considerable growth in your contact list. Note:- The Advacnce Plan covers 9 more pricing schemes whose cost differs in accordance to the number of subscribers. 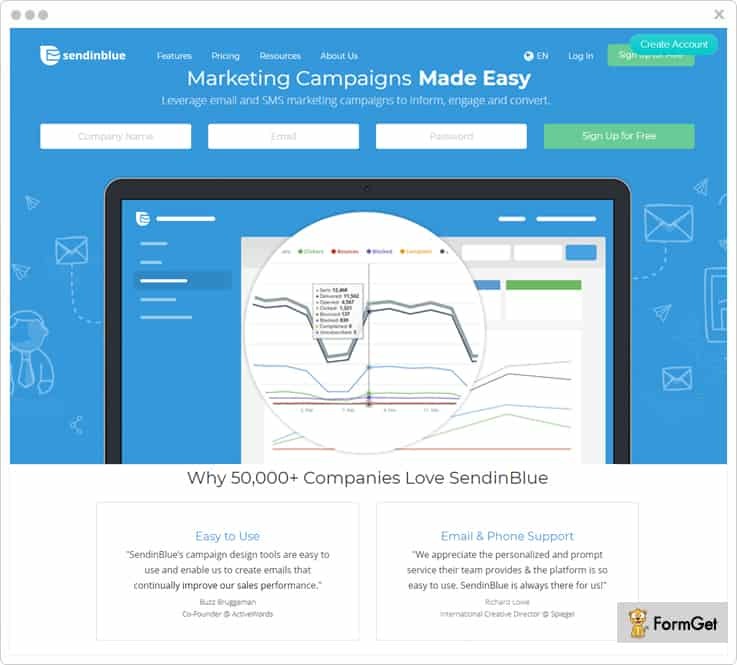 You can undoubtedly use SendinBlue to design mobile-friendly emails with the help of its drag-n-drop designer. The dashboard provides you with real-time tracking report to analyze elements like open & click-through stats, readers interest, etc. which you can also export in PDF/CSV format. Spam Check & Inbox Testing – Inbox testing lets you perform deliverability test of your emails. Whereas you can also create a test list and send a test email before finally propagating your emails to the contacts. Marketing Automation – You can automate the workflow and allow automatic retargeting your contacts after analyzing their response to your email and other activity associated with the campaigns. Contact Management – This feature lets you sort, filter and segment contacts & further process the targeted campaigning. Moreover, you can also create dynamic lists that update automatically. Note:- Contact sales team to inquire about the pricing of Enterprise Plan with which you can send 350,000 emails/mo. Moosend is one of the best email marketing service designed for all type of business whether it is small or a medium one. It also offers advanced segmentation, API and other integrations that make it different from other email marketing software. It empowers you to increase your subscriber’s lists by adding opt-in forms to a website or social platforms like- Facebook or to a third party sign up form. Furthermore, you can increase your contact list by importing all the contacts directly to your Moosend account from a file on your disk or directly from external sources. 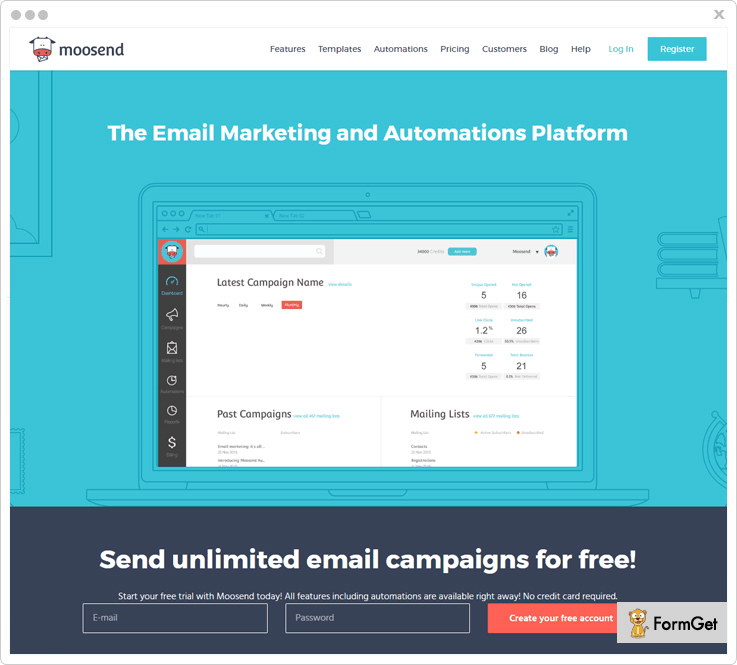 Automation – Moosend offers automation editor that helps you in implementing workflow in automation, data sync and sends campaigns specifically based on the subscribers’ behavior. 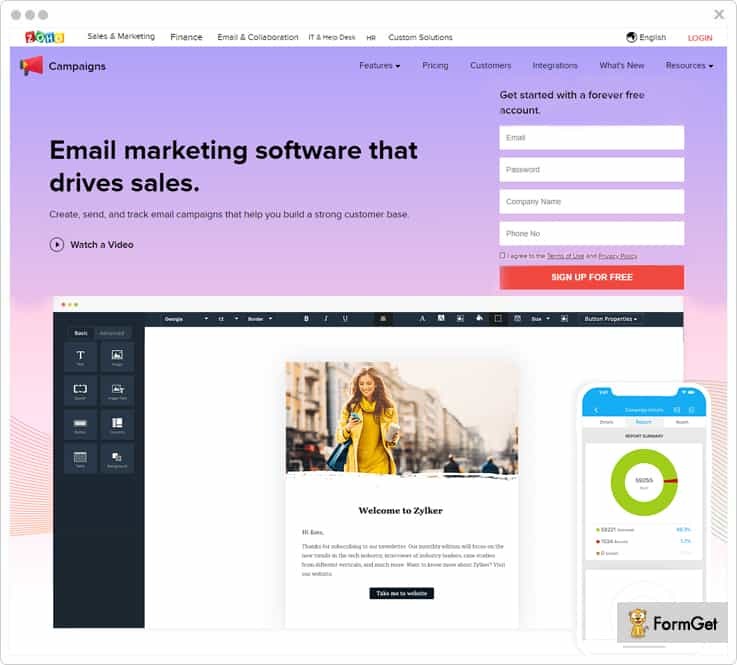 Editor – Provides you with the flexible and rich newsletter editor that allows you to design your own email newsletters without selecting from the limited once. Also, it provides options to select from the variety of responsive newsletter templates. Analytic tracking – Analytic tracking of the Moosend can be done by observing its real-time stats that provides complete knowledge of the various aspects such as conversion tracking, open/click rate, multilevel bounces and many more. Custom Fields – By using the custom field you can collect data of your verified subscribers such as their date of birth, and many more. This data can be further used by you in the future. These are just 3 pricing plans out of many. Moosend provides 6 months and annually plans where you can save 15 & 20 percent. There is one more plan “pay-as-you-go” as that is only for the occasional senders. One of the important Sendy alternatives includes Zoho Campaigns in the list. This software lets you create, send, and track email campaigns in the best possible manner. The dashboard provides you full control of various elements such as campaigns, subscribers, automation, reports and a lot more. Also, with its preview option, you can see how your newsletters will look at the recipient’s end on various devices. Consent Campaigns – The permission-based email marketing is always fruitful as you seek for consent from the contacts and then send newsletter/promotional emails. This is a kind of assurance of achieving higher open rates of your emails. Mobile Edition – You can perform a lot of activities with its mobile application which is available in different languages. For instance, you can manage your lists, schedule campaigns, pause/resume campaigns, view campaign results etc. Social Media Promotion – Share your email campaign on social media in the form of links, images, or quotes. Zoho Campaigns integrates with Facebook, Twitter & LinkedIn so that your promotions & offers can reach out to more audience. Here we have discussed just one pricing scheme of the subscriber-based plan. However, it has several other schemes according to the different number of subscribers. It has got an email-based plan as well with many pricing schemes. It’s starter plan comes with a price tag of $3 for sending emails up to 500 emails. The dashboard gives you a quick access to various stats like the number of emails sent, emails marked as spam, bounced, suppressed etc. You can also refer to the email performance graph of the various time range. Moreover, it also provides major functionalities like automation, design & personalization (using drag and drop, rich text, merge data etc. ), triggered messaging based on events, segments etc. It also encapsulates the on-site and in-app behavior of every individual subscriber to build their unique profiles. Auto Refresh – You also get the functionality of auto-refresh in the draft section where you can view the drafted emails & webhooks. This auto-refresh option is applicable to sections like delivery log & activities as well. Combining Segments – Create segments on the basis of multiple parameters such as user’s page views, email activity, events & attributes. You can also use a combination of segments to produce new criteria. Push Notifications – Send messages to the customers from your triggered campaigns directly via Customer.io or Urban Airship. Also, you can apply more than one condition while configuring a triggered email. Below mentioned pricing is for Basic Plan of this service. These pricing plans are just 3 cost estimations of this plan out of many. Note:- The Premium Plan is available for advanced needs, large, or fast-growing businesses and starts at $1,000/month. However, you need to get in touch with the sales team to know cost estimations specifically for the number of subscribers. 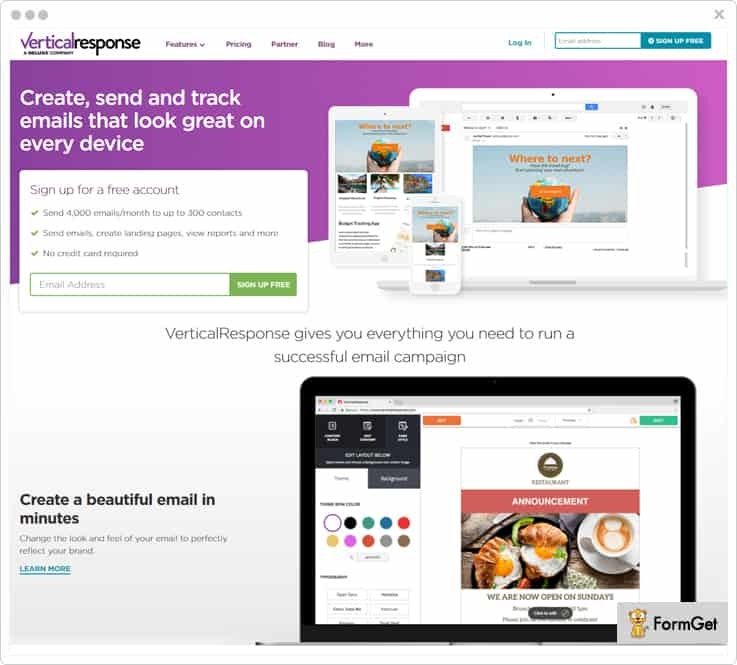 VerticalResponse is a popular competitive of Sendy as this email marketing software has qualities which is apt for every email campaigns. Moreover, you can create custom-branded emails, responsive & customizable surveys to capture more leads easily. It has got various add-ons which are very useful such as landing page builder, automation of email series, autoresponders, advanced reporting, integrations, A/B testing, contact management and more. Preference Centre – You can make the list “public” & let users choose what types of emails they want to receive in the future. This helps you to keep your contacts intact as they do not tend to opt out of your mail service because of receiving unwanted emails. Test Kit – Using tools like inbox & subject line preview and link checker, you can review the look & performance of your emails at recipient’s end across different devices. Automation – With the help of automated follow-up emails series, autoresponders & scheduling option you can be in touch with your clients with relevant & timely messages without much manual efforts. Note: – It’s “pay as you go” option lets you buy a required number of email credits with the one-time payment. 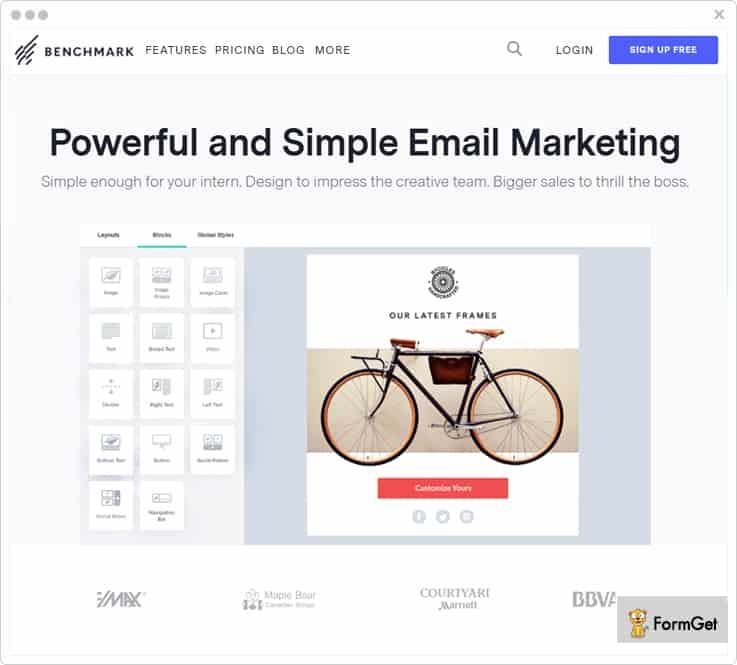 Benchmark is an advanced marketing service with a user-friendly interface to create emails by simply dragging n dropping the desired blocks along with live editing option. The automation enables you to send personalized welcome email series, follow up emails etc. by defining the trigger elements like time and events & deliver appropriate emails to every contact at the right time. Grow Contact List – You can add contacts to the list in various ways like you can import contacts from a file by uploading .xls, .csv, .txt files or via importing contacts from an integrated service such as Google Contacts, Zoho, Microsoft Dynamics CRM etc. List Management – This feature takes care of every step involved in managing the contact list, be it importing contacts, segmenting them & integrating them with services like Zapier, WordPress, Salesforce etc. Advanced Reporting – Benchmark provides you with the number of reports on various subjects. For instance, reports on emails, automation, A/B test, complaints, survey & polls. You can monitor metrics like opens, bounce rate, clicks on links, forwarding your emails etc. in real-time. Cost $11.57/Mo. $280/Mo. $592/Mo. $3967/Mo. Note:- Every plan has got subsequent pricing plans with pricing schemes for the different number of emails & subscribers. 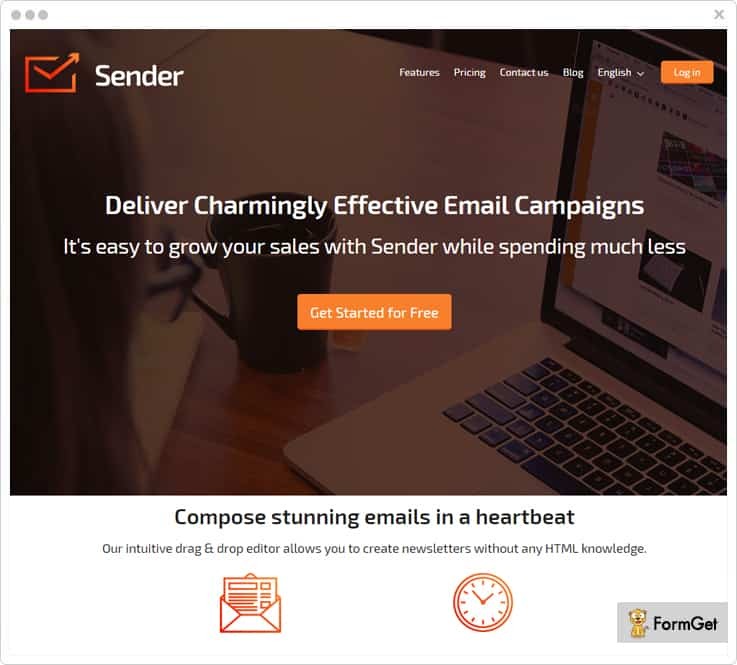 Sender is as an efficient email marketing tool that can also be regarded as an amazing Sendy alternative. You can use its drag & drop editor to create responsive newsletters & send emails with high deliverability to recipient’s inbox. One of the best parts of using this service is that it automatically disables non-existing email addresses to keep your contact list updated every time. Furthermore, its advanced email analytics facilitates you with open & click tracking, date & time analysis, click map, subscriber profiles, etc. in real time. Push Notifications – These are the messages that are sent to the user once he opts-in to your email service even when they are not browsing the website. This is considered one of the advanced marketing technique to re-engage potential customers. Feedback Loop Integrations – Sender provides integration of feedback loop system with major email service providers, such as Outlook/Hotmail, Yahoo etc. & notifies you whenever your sent mail is marked as spam by a subscriber. Dedicated IP Addresses – You ought to use this service if you are sending emails in bulk, say over 5,00,000 emails in a month. This is because it provides you with dedicated IP to improve sender’s reputation. 1. Its Monthly Plan has multiple pricing plans with the highest costing of $226 for 1,00,000 subscribers. 2. The Prepaid Plan also has different cost estimations as per the number of emails you want to send. The least plan comes with a price tag of $34 for 10,000 emails. MailChimp is an outstanding marketing automation platform that works with equal efficiency for small e-commerce shops to big online retailers. Moreover, it integrates with all the major e-commerce providers. Later, you can monitor the activities of subscribers & use the purchase data to send personalized campaigns. 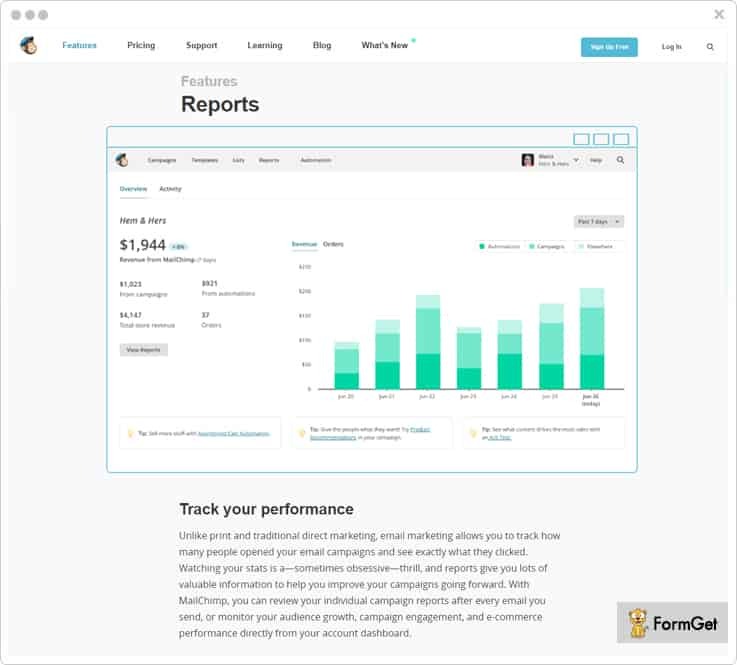 MailChimp allows you to manage a lot of things like custom signup forms, segments groups, subscriber profiles, analytics etc. very easily through the mobile app as well. Some other important highlights of this tool are inbox preview, time zone delivery, personalized postcards & order delivery etc. Unlimited Creation – Build email templates, landing pages, marketing channels like Facebook & Instagram Ad campaigns, Google remarketing ads and much more. You can use merge tags that let you add content to email dynamically. Abandoned Cart Notifications – You can remind your customers what they’ve left behind in the previous purchase and encourage them to complete their purchase and pair with product recommendations to suggest similar products. It is one of the best ways to reconnect with customers. RSS-to-Email – With RSS-to-email, you can publish your content once and send it to your email subscribers. You can create custom RSS template, and control no. of posts & the frequency of sending, say daily, weekly, or monthly. Also, you can combine multiple RSS feeds into one email newsletter. Its Forever Free Plan is available at $0 which lets you send unlimited emails to 2,000 subscribers. 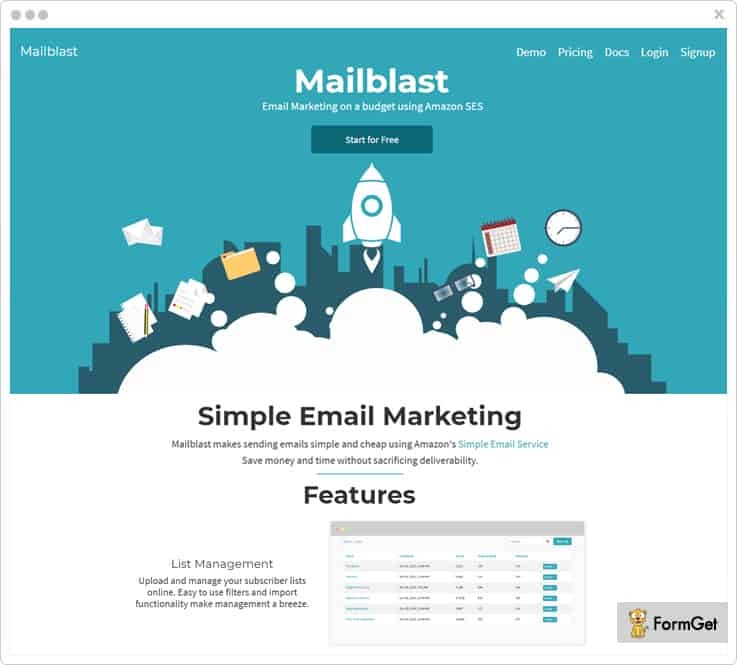 Mailblast is known to make emails sending process very simple and cost-effective as it using Amazon’s SES. Besides form builder for creating signup forms for your website, this Sendy comptetitors facilitates you with the functionality of DKIM enabling that ensures high inbox deliverability. It provides you with various functionalities like scheduling automated emails, detailed reports where bounce & complaints are automatically filtered for future campaigns. Dynamic Dashboard – Here you can handle templates, campaigns, automation easily. Further, you can organize the campaigns with various status like active, drafted, sent, sending, throttled, failed etc. Amazon Sandbox – You are facilitated to test your implementation in the sandbox mode before going live. Later, you can enable the production mode and increase the sending limit. List Management – Upload and manage your subscriber lists & avail easy-to-use filters and import functionality for your contact list management. Note: – Avail the free plan which provides 1,000 subscribers and unlimited emails. I strongly believe you will be benefited a lot after going through this article as it consists of some of the best Sendy alternatives. This hand-picked compilation is based on days of research, feedbacks & personal usage. Your only task from the to-do list is to figure out which software will serve your purpose and you are halfway done. This is because you will be owning a successful email marketing campaign in no time by using these Sendy substitutes. Still got any doubts? Have suggestions to make? We always welcome your valuable opinions, so drop your comments in the below section.